Waterborne emulsion based on high quality natural wax, suitable for interior use. It provides unique protection and durability on decorative styling stuccos it is applied on. It contains special additives that ‘add’ luster to surfaces, highlighting their style and textures. It thus creates an excellent finishing touch with splashes of color, making them (surfaces) comparable to the magnificent feel and aesthetics of real marble ones. It showcases the decorated surfaces, adding depth, without affecting their shades. 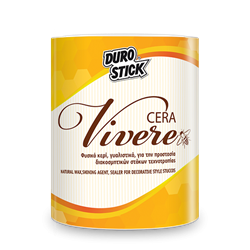 CERA VIVERE is ideal for decorative styling stuccos applied on walls, either in paste form like STUCCO VIVERE, and cementitious stuccos, like MATIZ Stucco Decorativo of DUROSTICK. 1lt/12-13m² per coat, depending on the surface absorbency.